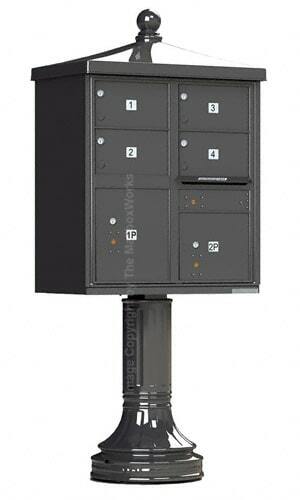 Upgrade your 4 door parcel locker unit with the Vogue Classic Accessories 4 doors kit. The fashionable Florence Vogue Classic accessories 4 doors kit add an extra touch of exterior protection to 4 door Outdoor Parcel Lockers. 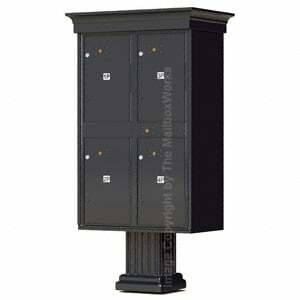 The brand new, redesigned Florence 4 Door Outdoor Pedestal Parcel Lockers, shown here in black, are the highest quality outdoor centralized package delivery units available. 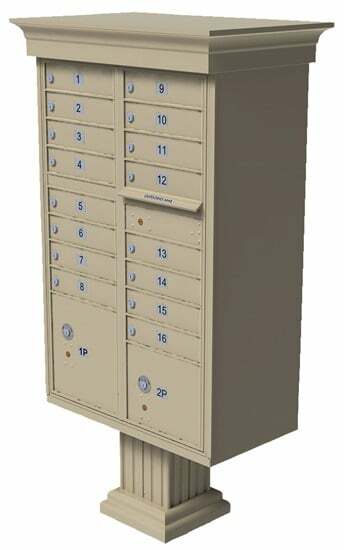 Outdoor Parcel Lockers are the perfect way to increase secure package delivery when installed with Florence CBU Cluster Mailboxes. 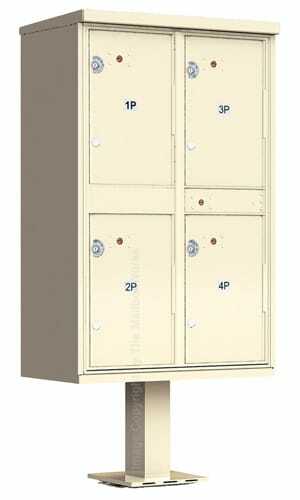 These outdoor apartment parcel lockers are constructed of 300 series stainless steel and aircraft grade aluminum. 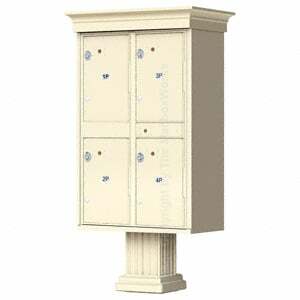 Online ordering has become hugely popular so so the cabinet and hood seams are robotically welded to provide higher security. 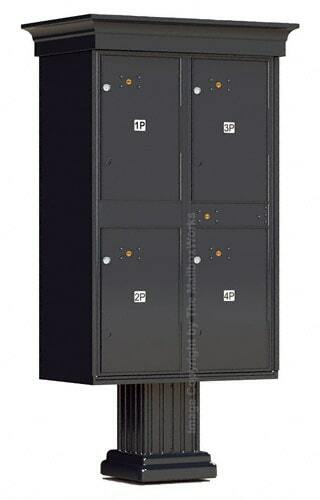 The parcel locker master loading door has interlocking overlap seams to prevent prying and meet the newest USPS security standards set for the F CBU mailboxes. 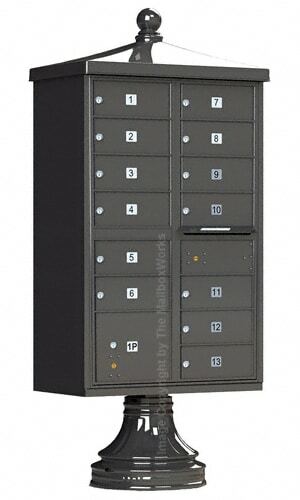 Silver adhesive metal decals with black numbers labeled 1P to 4P are included. 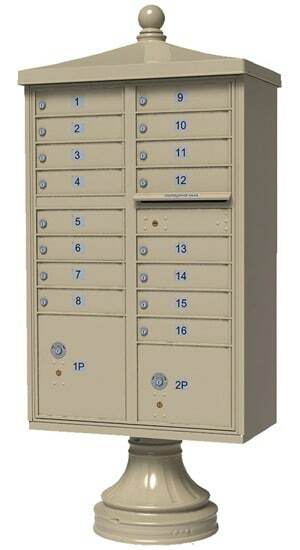 Custom Silver Decals for parcel locker doors can have up to 6 7/8″ characters; USPS recommends up to 3 characters. 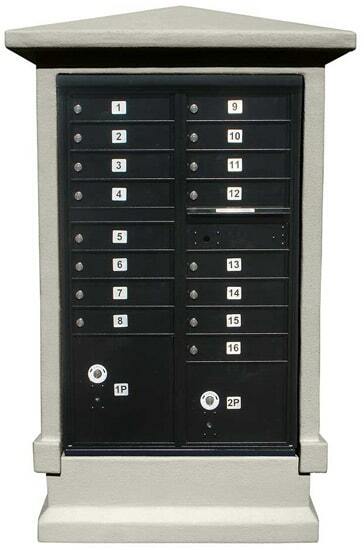 Custom engraving can include up to 12 3/4″ characters. Engraving comes with black or white color fill options.